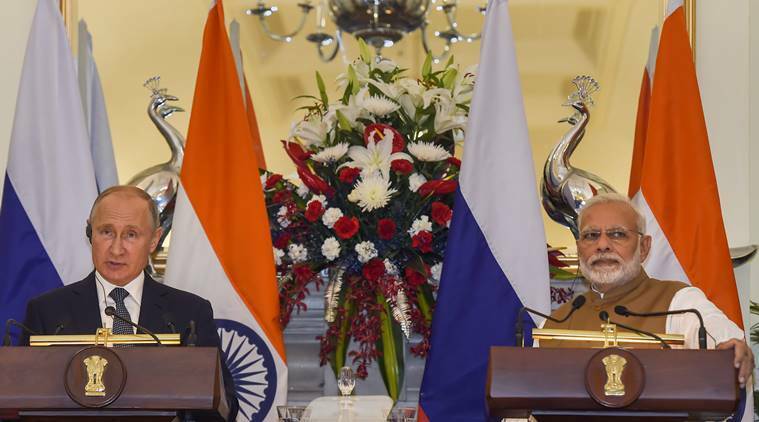 India and Russia have agreed to proceed with negotiations on the terms and conditions for the production of nuclear fuel assemblies in India. So far, fuel was being supplied by state-owned fuel utility JSC Tvel from Russia. After the conclusion of bilateral talks, India’s ambition to expand its nuclear expertise to projects beyond its borders has also got a further boost with the two sides having reached a pact on facilitating the participation of Indian companies in Russian-designed nuclear power projects in at least one more country other than Bangladesh, where Indian companies are already participating in an upcoming project. The two sides are also understood to have agreed to proceed with negotiations on the terms and conditions for the production of nuclear fuel assemblies in India. So far, fuel was being supplied by state-owned fuel utility JSC Tvel from Russia. On the second location, the Russians had earlier been offered a site in West Bengal — Haripur — but agitation by landowners forced the state-government to drag its feet on land acquisition. The Department of Atomic Energy is subsequently learnt to have commenced the search for a different site. Apart from the Rooppur project in Bangladesh, where work formally began on November 30 last year and involves participation by the state-owned Nuclear Power Corporation of India ltd (NPCIL) as a subcontractor, Russian light-water reactor-based nuclear power plants are under various stages of construction in Iran, Belarus, Hungary and other countries. The fine print indicates that the cooperation with India could be extended to at least one more site other than Rooppur and potential target areas include South and South East Asia, West Asia, Sub-Saharan Africa and Latin America. For the proposed Rooppur project that is slated to come up on the eastern banks of the Padma River in Bangladesh’s Pabna district, about 160 km from Dhaka, a “framework for interaction” has already been embedded into the trilateral pact signed for the project between Russia, India and Bangladesh, wherein Indian expertise is being used in the implementation of works related to the project, especially in the field of personnel training and consulting support. Indian companies such as HCC (Hindustan Construction Company) that have gained exposure in the construction of the two Russian-built reactor at Kudankulam, Tamil Nadu, could also be roped in “for construction and installation works, the supply of materials and equipment of a non-critical category” for the Rooppur project, which the Russians are building in Bangladesh on a “turnkey” basis. Since it is not a member of the Nuclear Suppliers Group (NSG), the 48-nation cartel that controls the export of fissile materials, equipment and technology globally, India cannot directly take part in the construction of nuclear power plants in other countries. It, however, has individual agreements with Bangladesh and Russia for collaborations in the nuclear sector. That is likely to be the route applied for participating in projects in other countries, officials indicated. The basis for the trilateral nuclear agreement is the Strategic Vision for Strengthening Cooperation in Peaceful Uses of Atomic Energy signed between India and Russia four years ago. According to the December 2014 pact between India and Russia, the “two sides will explore opportunities for sourcing materials, equipment and services from Indian industry for the construction of the Russian-designed nuclear power plants in third countries”.